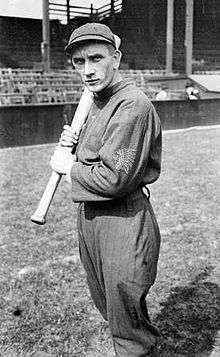 Walter James Vincent Maranville (November 11, 1891 – January 6, 1954), better known as Rabbit Maranville due to his speed and small stature — 5 feet 5 inches (165 cm) tall and 155 pounds (70 kg; 11 st 1 lb) — was a Major League Baseball shortstop. At the time of his retirement in 1935, he had played in a record 23 seasons in the National League, a mark which wasn't broken until 1986 by Pete Rose. Maranville finished third in the MVP voting in his first full season, playing for the Boston Braves as a 21-year-old in 1913 even though his batting average was just .247 in 143 games with two homers. The following year, Maranville was the runner-up in the MVP voting to teammate Johnny Evers as the Braves won the National League pennant and then went on to sweep the powerful Philadelphia A's in the World Series. That year, Maranville was the Braves' cleanup hitter, despite batting just .246 and hitting four home runs. Even at age 41, when Maranville batted .218 in 143 games and hit no homers, he finished in a tie for 12th in the MVP voting. 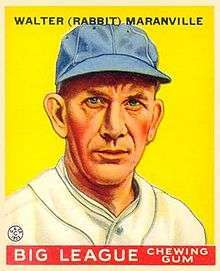 Over a lengthy career which spanned both the dead ball and live-ball era, Maranville played for the Boston Braves (1912–1920, 1929–1933, 1935), Pittsburgh Pirates (1921–1924), Chicago Cubs (1925), Brooklyn Robins (1926) and St. Louis Cardinals (1927–1928). He retired having compiled a .258 batting average, 2,605 hits, 1,255 runs, 28 home runs, 884 RBI and 291 stolen bases. As a shortstop, he finished his career with a positional record 5,139 putouts. He won his only World Series championship in 1914 as a member of the Braves, and won his only other National League championship in 1928 as a member of the Cardinals. Maranville was known as one of "baseball's most famous clowns" due to his practical jokes and lack of inhibitions. When he was appointed manager of the Chicago Cubs in 1925—one of their worst seasons ever—he did not change his behavior. One night he went through a Pullman car dumping water on sleeping players' heads, saying, "No sleeping under Maranville management, especially at night." Not long after that, he was out on the street outside Ebbets Field in Brooklyn mimicking a newsboy hawking papers. He cried out, "Read all about it! Maranville fired!" And so he was—the next day. Following the end of his playing career, Maranville turned to managing, including stints as a minor league manager for Montreal Royals, at Albany, Elmira, and Springfield, Massachusetts. In later years he worked as the director of a baseball school sponsored by the New York Journal-American newspaper. Rabbit Maranville was felled by a heart attack shortly after midnight on January 6, 1954 at his home in Woodside, New York. Death was nearly instantaneous. He was 62 years old at the time of his death. Maranville was inducted into the Baseball Hall of Fame in 1954, just months after his death, along with Bill Terry and Bill Dickey, in his 14th year of eligibility. ↑ Pietrusza, David; Matthew Silverman; Gershman, Michael (2000). Baseball: The Biographical Encyclopedia. New York: Total Sports. pp. 707–708. ISBN 1-892129-34-5. ↑ James, Bill (2003-04-06). The New Bill James Historical Baseball Abstract. New York: Free Press. pp. 615–617. ISBN 0743227220. 1 2 3 4 "Rabbit Maranville Dies at 62; Sparkplug of '14 'Miracle' Braves," Brooklyn Eagle, vol. 113, no. 5 (January 6, 1954), pp. 1, 15. Wikimedia Commons has media related to Rabbit Maranville.